SVMSched   is a tool designed to enable on-demand SaaS clouds on virtualized infrastructures, and can also be easily set up to support PaaS clouds. SVMSched can be used to build cloud platforms where a service is deployed to compute a user-given dataset with a predefined application based on a given hardware requirements (CPU, memory). In such a context, SVMSched seamlessly and automatically creates a custom virtual computing environment to run the service on-the-fly. Such a virtual computing environment is built to start the execution of the service at the startup, and is automatically destroyed after the execution, freeing up allocated resources. Configuration-based On-demand Cloud Services: A SVMSched cloud is based on a single configuration file in which you define a set of software services that you wish to provide from your virtualized infrastructure. This configuration file also supports parameters to connect to the OpenNebula server, scripts and data necessary to automatically build virtual environments to run services, etc. Automatic provisioning and high-level abstraction of virtual machines: After deploying SVMSched in your cloud infrastructure, you don’t longer need to manipulate virtual machine templates. Actually, to run a service you only need to make a simple request in the form of “I want a virtual machine with 4 CPUs and 512 MB of memory to compute a given set of data with a specific application”. Then, SVMSched does the rest for you (prepare the virtual machine’s image, instantiate the virtual machine, deploy and start the virtual machine on a node it selected seamlessly, start the execution of the service within the virtual machine, shut down the virtual machine when the execution is completed). Scheduling: SVMSched enables advanced scheduling policies such as task prioritization, best-effort along with automatic preemption and resuming (plus migration, where required), resource sharing, etc. Remote Data Repository: SVMSched is designed to allow you to define shared data repositories on the network that can be mounted automatically within the file system of virtual machines at startup, before starting the execution of service. Such a repository can be useful to store binaries, and any other data required by the compute tasks. It thus provides a mechanism to ease the handling of input and output data. Hence, you can avoid handling large virtual machine images (requiring large time of setting up), while minimizing the risk of losing data and computation already done if a virtual machine failed unexpectedly. Works as a drop-in replacement for the OpenNebula’s default scheduler (mm_sched). Enables a specific socket interface managed by a listening daemon. The socket works over the IP protocol, thereby enabling the possibility to have remote clients. Enables a built-in UNIX-like command line client. The client can be located in a different server than the SVMSched daemon. Communicates with OpenNebula through the XML-RPC interface. SVMSched and OpenNebula can be hosted on different servers. Relies on a single XML configuration file; Not need to manipulate virtual machine templates. Without being exhaustive, these are some situations where SVMSched can bring you significant added values. 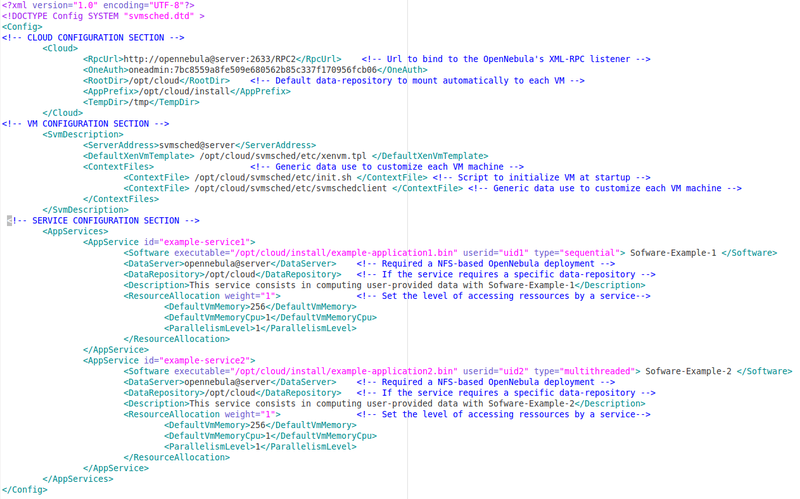 Define one or more services in the SVMSched’s configuration file according to your needs. E.g. a service can consist in running a specific unit test script. If necessary, set up a data repository (a shared network file system) in which binaries and data required to run services will be located. We recall that SVMSched enables to mount this repository automatically into the file system of virtual machines. Finally, running a service is a straightforward task. For example, the following command allows you to run an instance of the service named “example-service1” using a virtual machine having 2 CPUs and 1024MB of memory. In the example, we assume that the input data is located in /data/repository/file.dat, specified with the -a option. Define each practical session as a service in the SVMSched’s configuration file. For each service, set a data repository in which specific software binaries and libraries and data required for that practical session will be located. We recall that SVMSched enables to mount this repository automatically into the file system of virtual machines. For the main program (executable), use a simple script that enforces a sleep for a given duration. Finally, for each student who should attend at a given session you only need to request a virtual machine with specific hardware requirements (memory and CPU), for a given duration. The example below show how to create a virtual machine with 2 CPUs, 1024 MB of memory and a lifetime of 3 hours. HINT: If all virtual machines need the same the requirements, you can use a loop according to the number of attendees. A typical case is when you want to use idle resources of a production infrastructure to carry out some development tasks such as software testing (init tests, Non-Regression Testing or NRT, etc.). SVMSched allows you to distinguish production tasks (prioritized and non-preemptable) to best-effort tasks (non-prioritized and preemptable). So, when operating, SVMSched can automatically preempt best-effort jobs when there are not resources available to run queued production tasks. Preempted jobs are automatically resumed as soon as resources become idle. The decisions of preempting and resuming are took autonomously. Assuming that you already set up a SVMSched cloud, the following commands show how to run two jobs in production and best-effort modes, respectively. SVMSched (Smart Virtual Machine Scheduler) is a tool designed to enable and ease the set-up of on-demand SaaS and PaaS services on top of OpenNebula. SVMSched is open source and available for free downloading . However, SVMSched is still at a development stage, not yet production-ready. Being an ongoing project, feedbacks and collaborations are appreciated. So, don’t hesitate to contact authors if you have questions, suggestions, comments, etc. Rodrigue Chakode, Blaise-Omer Yenke, Jean-Francois Mehaut. Resource Management of Virtual Infrastructure for On-demand SaaS Services. In CLOSER2011: Proceedings of the 1st International conference on Cloud Computing and Service Science. Pages 352-361. Noordwijkerhout, Netherlands, May 2011. C12G Labs has just announced that it has joined the Open Virtualization Alliance (OVA), a consortium committed to fostering the adoption of open virtualization technologies including Kernel-based Virtual Machine (KVM). The OpenNebula project is excited to join an interoperable ecosystem of components around KVM. These are also great news for the OpenNebula community where KVM is already a popular virtualization platform. The mission of the Open Virtualization Alliance is to foster the adoption of KVM as an open virtualization alternative, accelerate the emergence of an ecosystem of third-party solutions around KVM, increase overall awareness and understanding of KVM, encourage interoperability, promote best practices and highlight examples of customer successes. The Open Virtualization Alliance today announced broad industry support and adoption with the addition of 65 new members to the consortium. Governing members of the Open Virtualization Alliance include HP, IBM, Intel, and Red Hat. Starting this month, we will be publishing a monthly newsletter on our blog providing a recap of the previous month’s OpenNebula news, and giving an advance of what to expect in the coming month. So, without further ado, here is the June 2011 newsletter! On the technology front, we provided a first glimpse into the upcoming features in OpenNebula 3.0, which will provide a lot of added stability in many backend components, and major improvements in networking and multi-tenancy support. C12G announced an enterprise-class distribution of OpenNebula 2.2 and new professional services. They also contributed a scalability guide that addresses how to install and tune OpenNebula for optimal and scalable performance, a guide on integrating public clouds with OpenNebula for “cloudbursting”, and a guide on image contextualization. Finally, Alberto Zuin contributed a detailed guide on setting up High Availability in OpenNebula with LVM. Our community continues to grow (check out our list of featured users) and to contribute software to the OpenNebula Ecosystem. Most notably, Florian Feldhaus and Piotr Kasprzak, from TU Dortmund, released the first version of their OCCI for OpenNebula project. This exciting new project aims to develop a complete, robust and interoperable implementation of OCCI 1.1 for OpenNebula. This month, OpenNebula participated in the EGI User Virtualisation Workshop, which highlighted the wide deployment of OpenNebula in HPC and Grid systems. To answer questions from the community more interactively, we held our first OpenNebula IRC sessions on May 9. Finally, we announced that C12G and OpenNebula will contribute to the European Cloud strategy through their participation in the panel about Cloud Computing Fostering Innovation of the workshop Towards a Cloud Computing Strategy for Europe: Matching Supply and Demand. What can you expect from us this month? We will be working hard on OpenNebula 3.0, so stay tuned for more blog posts on all the new features we will be including in our upcoming release.